← Keeping Your First Karwa Chauth Fast- Good To Know Tips! You Know That Diwali Is Near…. Diwali means “arrival of happy times” and “creation of unforgettable memories”. Another Diwali is knocking at the door and like everyone else, you are also tempted to enjoy this season of greetings. Diwali gives you a chance to meet all the old buddies and spend some quality time which usually doesn’t happen for the rest of the year. This is also the time to plan gifts for friends and relatives. 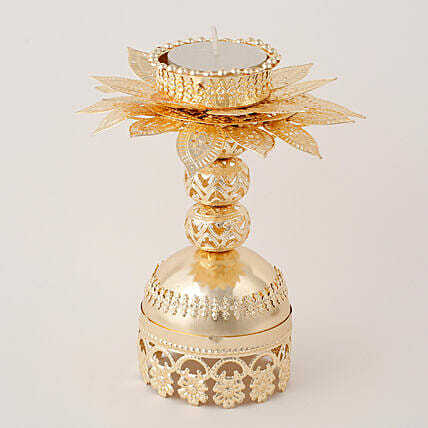 Gifts play a major role in any festival or special occasion as they enhance the sweetness in a relationship. Check these amazing and unique Diwali gift ideas and surprise your loved ones. 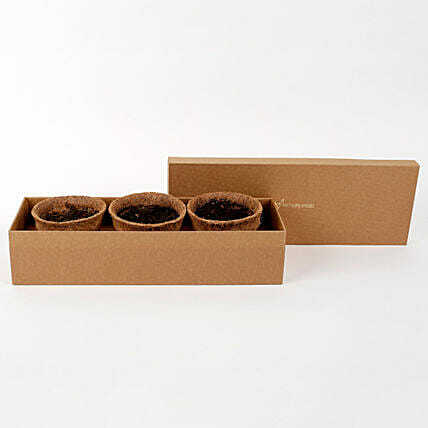 Promote eco-friendly thoughts among your friends and relatives this Diwali by gifting them this unique self-growing plants kit with seeds and coir pots. It is high time that we all take up our social responsibilities well because the environment is at a stake! These coir pots are 100% bio-degradable made from coconut husk. Thus they would readily transform into organic matter on decomposing. Along with these husk pots, this gift set also includes 3 bags of manure, cocopeat, and vegetable seeds packet. For those who have a busy schedule can also enjoy gardening because this is a self-growing kit that has everything needed to plant the seeds available in the box. Those friends and relatives who are new to gardening would find boost with this beautiful & unique Diwali gift. One can plant the seeds in these coir pots & then plant the whole thing into the ground. As the coir pots decompose they would provide essential nutrients like zinc, copper, or magnesium to the plant. Another advantage of these coir pots is that they are lightweight. All the said ingredients would come packed in a sturdy cardboard box. One of the basic ingredients of Diwali is the firecrackers. Firecrackers are ignited as a mark of victory of good over evil. Fire Crackers, of course, lead to some amount of pollution but there are eco-friendly crackers too and you all must opt for them. This is a box of firecrackers – that too edible ones! 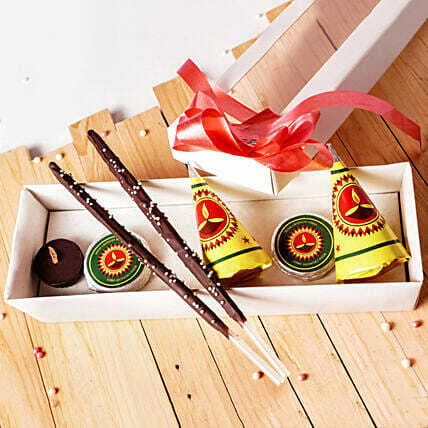 Premium quality chocolates are given the shape and look of firecrackers – isn’t that great? Chakris, Anaars, Rockets, Fuljhadis – all the major crackers are found here. Enjoy the festive season with these unique and tasty chocolates. It would be a great gift idea for kids and best buddies. For a hefty client, important customer, or a prospective business partner, this premium Diwali goodies hamper is a perfect choice. This would also be a unique Diwali gift for the whole family. 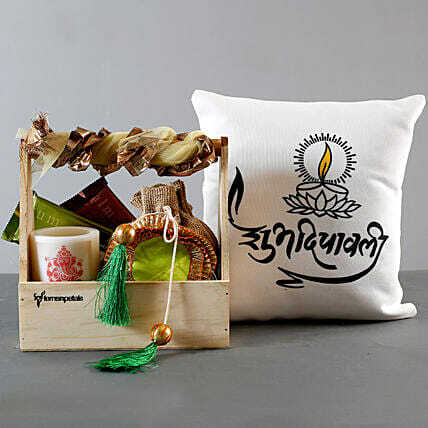 It contains dry fruits, chocolates, designer glass candles, wooden coasters, metal shubh labh, and Ganesha Toran. You can alter use this sturdy briefcase holding these amazing products for keeping jewelry items or documents, etc. Diwali is the festival of lights and that’s why any source of light would be a great gift option. A T-Light Holder holding a candle would not only remove darkness but would also add much beauty to your home. Made from sturdy metal, this t light holder has a flowery appearance. The golden color symbolizes extravagance, wealth, riches, and excess. Place this t light holder at the main entrance door or at the center of your living room. 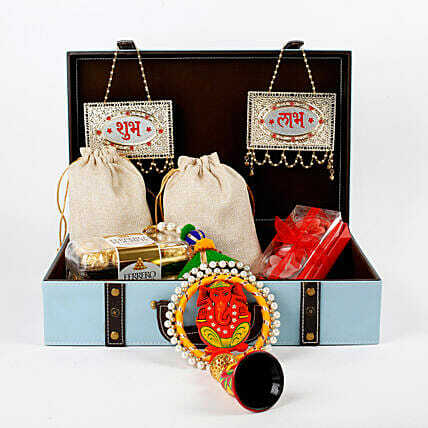 You can get this beautiful and unique Diwali gift and greet your parents or relatives! Do you know that two glasses of champagne a day is good for heart and blood circulation? Champagne contains polyphenol and antioxidants which helps in reducing the risk of heart attack or stroke. It also carries resveratrol – a potent antioxidant that acts as a shield against skin damage, reduces bad cholesterol, and averts blood clots. 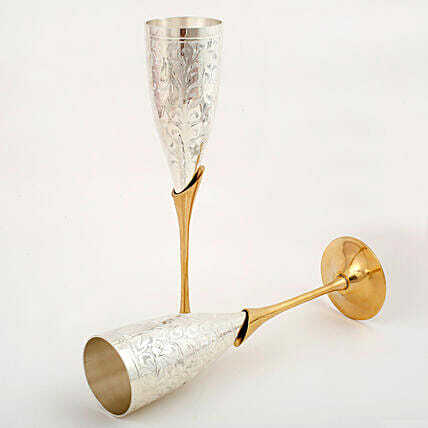 If your loved one is a champagne lover, then surprise him/her this time with this elegant and unique silver champagne glasses. Diwali is the time to meet and greet friends and relatives and that leads to parties and relaxing get together moments. These glasses would surely bring the shine to those parties. The basic principle of Feng Shui is increasing the “positive energy” by combining the 5 elements of nature. A Pagoda which is a tower with a wide base that gradually narrows to the top indicates a focus of energy leading to a connection with heaven. As per Chinese ancient stories, the pagoda was used as a tamer of tempestuous characters. Such unruly and boisterous persons would be imprisoned in a pagoda until they reached inner peace and became pleasant creatures. As per Feng Shui, a pagoda is the creator of energy and propagator of progression. 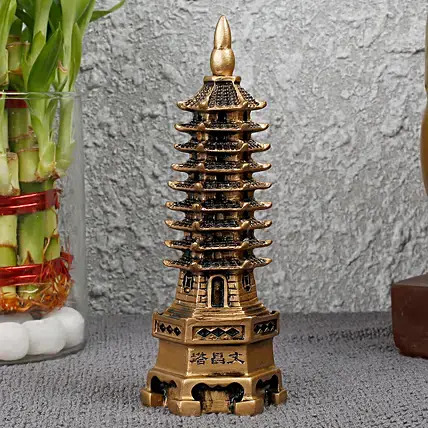 This is a 9 level Feng Shui Pagoda that would be really a unique Diwali gift idea to greet good luck to your loved ones. You can gift it to students who are poor at studies or who are targeting higher studies. It would help them attain academic excellence. Those suffering from illness would also prosper with this gift. You can also gift it to business personnel’s and aid them in achieving great heights. Who doesn’t love a good fragrance? The objective of a fragrance is to calm down the aggravated mind, relax the body, and uplift the confidence. 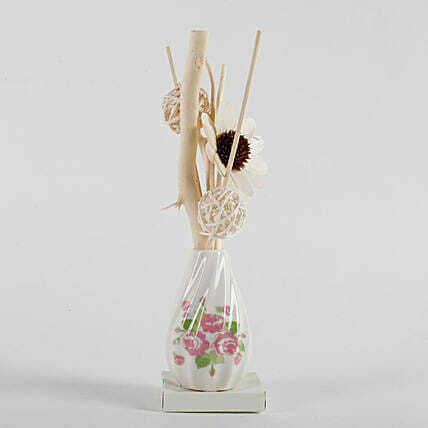 Thus, this rose print reed diffuser would be a unique Diwali gift idea for your loved ones. The reed diffuser will continue to evaporate into the air, creating a subtle and luxurious scent. You may use the vase later for further home décor use. For the prized people, you must have something grand in your mind. So, for those loved ones who are a very special part of your heart and soul, you can opt for this amazing unique Diwali gift hamper. The Lord Ganesha printed candle would evoke spiritual feelings in the mind while the Shubh Deepavali printed cushion would provide relaxation. The Lakshmi-Ganesha idols made from brass materials would pave the way for more good luck and prosperity while the chocolates would enhance the sweetness in your relationship. The small wooden basket holding these products looks elegant and can be later used for further home décor ideas. Diwali is the time to make new memories with loved ones. Gifts form a major part of this celebration and gifts also show your love, care, and feelings for people. So, scroll through some other amazing Diwali gift ideas too and make this Diwali a pleasant one.